Miami Herald: Miami’s Underline park has been talked about for years. Get ready for construction. 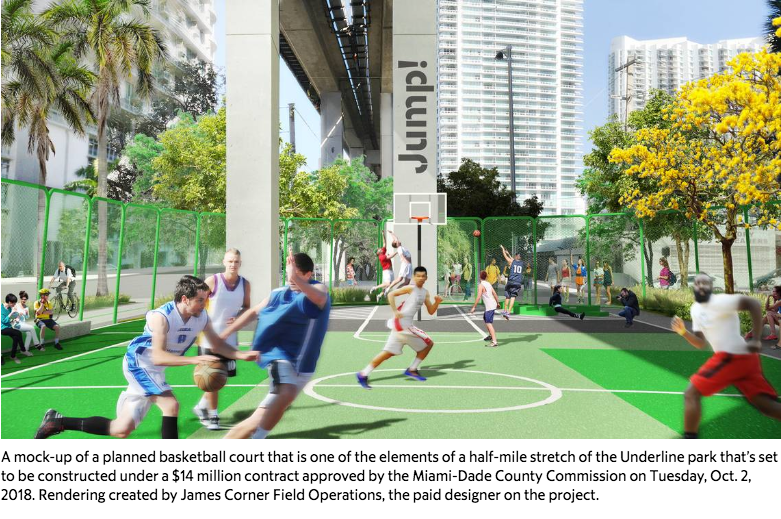 Last Tuesday, October 2nd, the Miami-Dade County Board of County Commission voted to approve the contractor for The Underline’s Phase 1, Brickell Backyard. Our team is excited about the vote, excited about groundbreaking and thankful for the positive coverage by the Miami Herald. After years of fundraising, lobbying and hype, the planned Underline park under parts of Metrorail’s elevated tracks has a government construction contract, with Miami-Dade commissioners approving a $14 million agreement to build the first half-mile of the project off Southwest First Avenue in the Brickell area. Using a mix of state, county and city of Miami funds, the two-year agreement approved Tuesday hires a partnership between a Hialeah-based specialist in walkways and a longtime Miami-Dade contractor. The 18-month contract requires the partnership, Central Pedrail, to expand the current paved path under the Metrorail and add a mini basketball court, workout equipment, game tables, extensive landscaping and other improvements designed to create a “linear park” that would eventually stretch from the Miami River to the Dadeland South Metrorail station. Building the entire 10-mile Underline park is expected to cost about $120 million, with another $3 million required to maintain it each year. The “Brickell Backyard” segment that was funded on Tuesday represents just 5 percent of the full Underline, but founder Meg Daly said she sees the launch of actual construction along the route as a larger milestone than the seven-block footprint between the river and Southwest Thirteenth Street suggests.